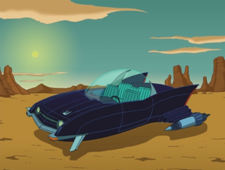 Fast cars were designed by Professor Farnsworth in his tiny one room apartment while he was living the life of a scientist. He designed the Trendy Night Spots and Beautiful Women in that room too. The car in the image is based on a personal luxury coupé called the Studebaker Avanti. This page was last edited on 1 February 2013, at 23:20.